One of the most-viewed and visited posts in my blog is “oladushki”. For those of you who doesn’t yet know the meaning – it’s Russian name for small pancakes. 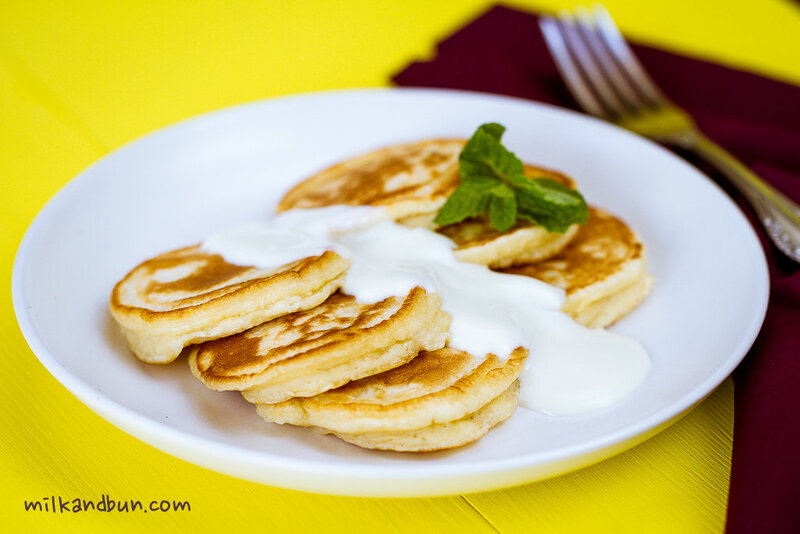 Yes, it’s absolutely incorrectly to call them blini as many people do (blini are large and thin like crepes, look here), and how they are usually called in restaurants or sold in stores. This is the perfect breakfast or brunch to spoil yourself with on the weekend, and it could be make in a short of time. Russian housewives most of the time use soured or any leftover kefir to prepare these soft beauties. You can try to substitute with buttermilk, drinking but thick yogurt, or as I did – used laban (local dairy drink). Oladushki go well with many sauces: honey, sour cream, sweetened yogurt, jam or sweet condensed milk. You can also serve them as a savory brekafast: with a cream cheese or sour cream along with cured salmon or caviar. finally, when you flip oladushki over – do not press it with spatula. I served oladushki with plum preserve and vanilla yogurt. All ingredients should be at room temperature, so take them out of the fridge 1 hour ahead. In a large mixing bowl, beat an egg with salt and sugar until fluffy. Mix in kefir. Sift the flour with soda into the batter. Whisk gently until the ingredients are just incorporated. Do not overmix – it leads to tough texture. Let the batter rest for a half an hour and then do not stir it again (otherwise the bubbles will deflate). Preheat the frying pan (until a drop of water skitters across the pan), lightly coat with oil. Carefully scoop the batter from the side of the bowl. When oladushki are dry around the edges and bubbles over the top – turn it over. Don’t press oladushki with spatula! Transfer to a large plate in a single layer, keep it uncovered (you may keep them in a warm oven), while preparing the rest. The best eaten fresh with your favorite sauces. But they also can be covered with a plastic wrap and kept in the fridge until next morning. 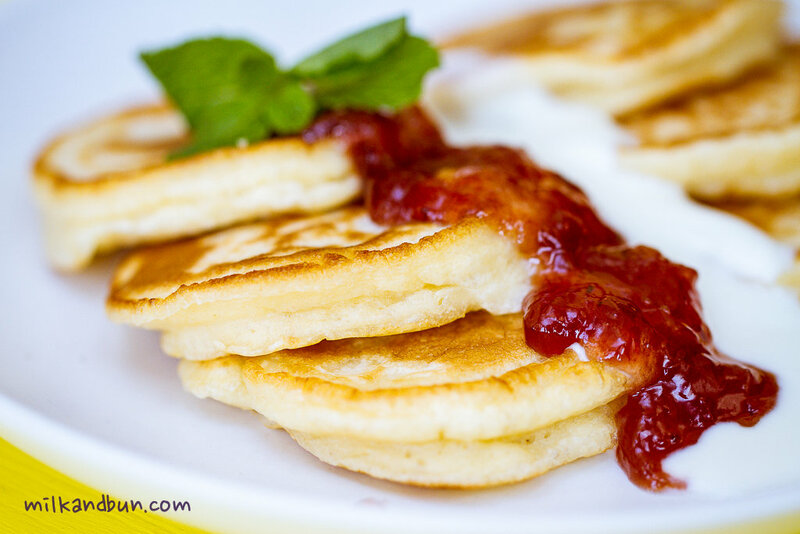 Apr3April 3, 2016 • By milkandbun • This entry was posted in Breakfast, Russian cuisine and tagged breakfast, cooking, DIY, easy cooking, easy recipe, food, food photo, food photography, food styling, foodpress, kefir pancakes, oladushki, pancakes, photography, photos, recipe, Russian, Russian blini, Russian cuisine, Russian food, Russian oladushki, Russian recipe, Sunday breakfast, weekend breakfast, weekend cooking. Bookmark the permalink. They’re so pretty! Aren’t blini made from buckwheat flour? It’s not necessary. 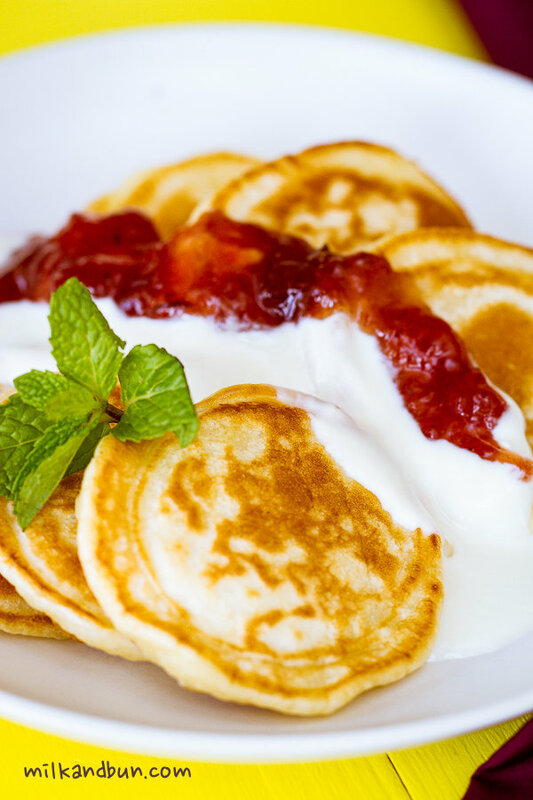 The main point is that blini are large and thin like crepes, and such fluffy or small are called ‘oladii’, both can be made from any flour. But most of the time they are prepared with plain white flour. Thanks for the interest and comment, Mimi! I’d love to spoil myself with some of these this weekend 😉 looks just delightful! These look amazing! It doesn’t help that I am so hungry right now! Lovely photo! I hope you’d had something delicious after reading the post! 😀 Glad you liked it, hope you will prepare these oladushki for your next breakfast! Thanks for taking time and commenting, Kristy! since i never tried these Russian pancakes , maybe when my mom makes these pancakes , when i take a bite it will taste really good after all.